The Top 6 Reasons Your Company Needs a Blog... Now! Seeking more readers or an increase in sales, there are so many benefits that a blog can have for you. In short, content marketing is the process of creating and sharing high-quality, free content with others. Killer content published on your website not only establishes you as an authority in your industry, it helps build strong relationships with your readers and increases online sales. You do not engage in content marketing for the sole purpose of promoting your company or brand, much like advertisements do. Rather, content marketing is for garnering interest amongst your target audience and drawing them to your website to see what you have to offer, but in a valuable-added way. Moreover, the content you publish should be informative, consistent, and should encourage your site visitors to take action. In the end, the goal of content marketing is to inform, entertain, and engage your site visitors, while also promoting your content, products, or services. Ultimately, with a strong content marketing strategy in place, you should be attracting new visitors regularly, turning them into customers, and retaining them as loyal followers. Have you ever noticed that some of your website’s pages rarely, if ever, change in terms of content? If the answer is yes, then you may also realize that once a site visitor views these pages, there is no reason for them to return because there is nothing new to learn by doing so. Unfortunately, this may be harming your efforts of attracting visitors and turning them into loyal customers. Additionally, this lack of new and fresh content is also harming you in terms of SEO optimization. That’s why having a blog on your business website is so important. In addition to the static pages you have on your website, it is essential you publish new blog posts to increase your chances of being found by new people and encourage those who are familiar with you to check back and see what’s new. You see, every time you publish a new blog post on your website, major search engines crawl and index your website. This helps you rank higher in search engine results, gets you found by more people, and helps build your authority as a reliable and trustworthy brand. Relying on organic traffic to boost your online sales or build your email list is ineffective, to say the least. Sure, some organic traffic will land on your website and be happy they did so. More so, they may even subscribe to your newsletter or purchase a product or two. But the truth is, incorrectly typed URLs, costly advertisements, and weak keyword searches may bring the wrong types of visitors to your website. However, one of the best ways to drive the right kind of people to your website is by incorporating a blog into your website that is SEO-optimized. For example, you can fill your content with strong keywords for getting found in search results and ranking higher with the likes of Google and other search engines. In the end, social media plays a large role in driving more traffic to your website. As word spreads that you are a great company, those that may never have noticed you before will, and they will come to your site looking for more. People will always have questions and concerns about the products and services your online business provides. And, as a successful business, it is your job to accommodate these questions in order to build authority in your industry and gain customers’ trust. People do not want to land on your website and only encounter promotional material. They want valuable information to use during the purchasing process. Luckily, a blog is an easy way to share everything you know about your niche and your company so that customers can make informed purchasing decisions. Blogs are one of the most cost effective ways you can share any kind of information with your target audience. Rather than spending big bucks on audience specific advertisements, you can simply publish killer content in many forms (think blog posts, podcasts, YouTube videos, and social media) and draw in traffic from many sources. In doing so, you eliminate the need to “promote” your company via ad slots on radio or TV, which are both notorious for being very expensive. If you already have a business website that has blogging capabilities, creating blog posts is free. It doesn’t get more affordable than that. And, if you are tight on time, you can typically find content writers to craft quality content for your website for reasonable prices. Altogether, creating great content is relatively inexpensive and establishes you as a solid business. With a blog that people enjoy reading, you no longer have to seek out the same customers over and over, convincing them to return. Instead, you will have them hooked from the start once they realize through your blog that your content, brand, and products are worth their hard-earned cash. As your blog becomes relevant in your specific industry, you are likely to notice that authorities preceding you may begin to traffic your website and make themselves known. This is especially true if you use the opinions and knowledge of strong authorities in your blog and connect to them via outbound links. The connection your build with others in your industry may help open up the possibility for networking opportunities, business partnerships, and business growth. Your website’s homepage is where site visitors form their first impressions. More so, your site’s landing pages are for directing customers through a specific sales funnel in hopes of converting them into buyers. Lastly, your About Me, Contact, and Services pages are for direct information. However, a blog allows for the personalization of your brand. 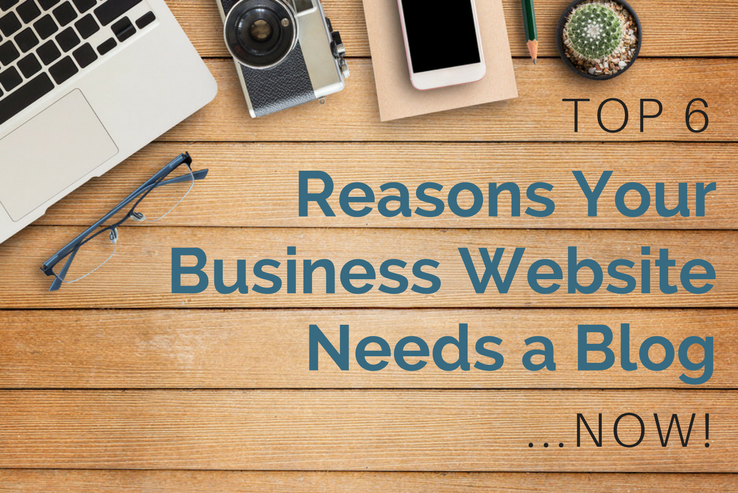 By starting a blog on your business website, you invite readers to see the real side of you. For instance, you can share what your company stands for and what you value as a business. In addition, you can reveal what kind of people you hope to help with your business. In the end, people appreciate the humanization of a business and are more apt to trust a company if they feel they know the people behind it. In the end, adding a blog to your business website is one of the best things you can do for the growth and success of your company. Whether you are seeking more readers or an increase in sales, there are so many benefits that a blog can have for you that there really is no reason why you can’t invest in one right now. What are your thoughts on the importance of having a blog section on your business website? Have you noticed an increase in subscribers or sales? I would love to hear all about it in the comments below!